I was 18 the first time I stalked, ambushed, and destroyed a cockroach on my own. That’s probably pitiful, considering I spent six years of my growing-up life in Puerto Rico (where one of my major childhood traumas…er, lessons, was that despite all the scurrying around they seem to prefer, that cockroaches do fly, especially in shopping-mall restrooms), followed by several years in Florida (where one of my major life lessons was not to take seriously any person who says, “that’s just a palmetto bug”). I’d stepped on a few Florida cockroaches prior to the beginning of the story I’m about to tell, but I don’t really count that. Number one, they don’t always die from a shoe strike, and number two, if they’re on the floor, the human already has the advantage, and they don’t often grant you that unless they’re already dying of whatever poisonous pest-control substance is around. 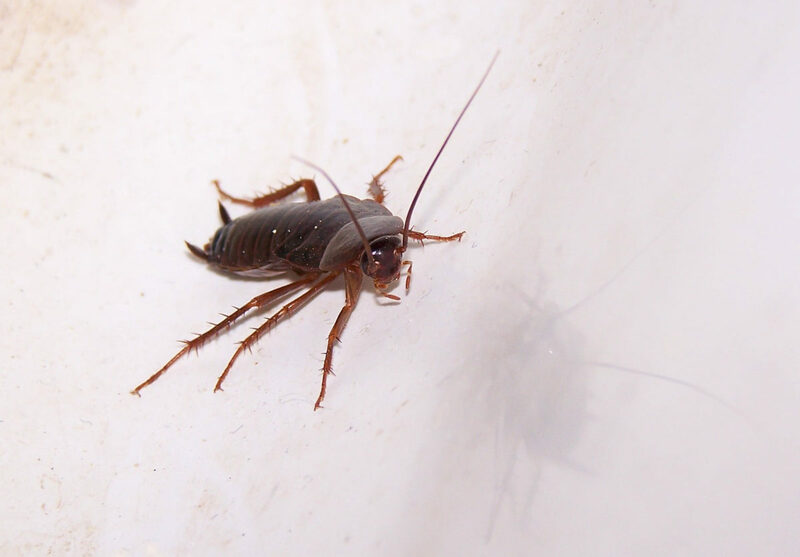 Cockroaches on ceilings, walls, hiding inside furniture — those are the hunts that truly count. So, back to the point, I was a grown adult human before having to hunt down and destroy a roach that was threatening the sanctity of my living space. I was in my college dorm room, getting ready for class. Which in those days probably meant half actual work, half watching reruns of Quantum Leap on USA. Sitting there, I gradually became aware that I was not alone in the room, in that way that only people in bug-intensive areas of the country can understand. That slight flicker in the corner of your eye. Something moved. Since this was my first time living on my own, I lacked some of the requisite tools for independent adult life in Florida. A can of Raid, for example. With one eye on the roach, I rummaged through my closet for any kind of weapon. I dug through my shoes. Flip-flop on a vertical surface? That was no kind of option. Even if I managed to reach up high and flip the roach onto the floor with a sandal edge, that opened the possibility that he would become agitated and start running, or, major heebie-jeebie alert, FLYING, and that was not happening. Desperate, I slid open my roommate’s closet door, and spotted some aerosol cans on the shelf. Vanilla air freshener! It would have to do. I aimed the can…and sprayed the roach with a huge amount of vanilla air freshener. As I feared, it bolted. The next thing I knew, I was regaining consciousness on the hard linoleum floor of my dorm room, and the roach, heavily vanilla-scented but otherwise unharmed, was halfway up the wall and scurrying toward the door. My right arm ached and pulsated. Slowly I flexed it. Pain exploded through my elbow, but it moved smoothly. OK, not broken. Probably. I sat up and eyed the roach, which had paused about a foot from the door, halfway up the wall. Then it walked, slowly for a roach, through the impossibly small gap on the hinged side of the door and disappeared. I certainly learned I was going to have to up my game if I ever expected to live independently in Florida. At some point in time, every object I own has probably been touched by at least one roach leg. Think about that. Everything in Florida that isn’t sealed in airtight plastic packaging has probably been touched by a roach. And they’ve probably climbed all over that plastic packaging.